This blog post tries to explore how fanfiction net offered by networked technologies and fan culture help English language learners develop their English language and writing skills by doing a case study on Nanako, a Chinese immigrant who posts her stories and maintain ing the discussion committed to a Japanese writer. From Nanako’s stories, it can be learned that her process of fanfiction writing gives her not only a chance to develop her confidence and motivation to continue her writing in English mostly while sometimes with Japanese and Chinese. On the oher hand, it also helps her to define her identity as an Asian with pride after exploring her identity in different ways over the years. During the process, the feedback given by readers from a linguistically and culturally diverse group of young people across the world and their feedback as well as the positive interactions between Nanako and the readers cannot be neglected. Since fanfiction writing needs knowledge of social discourses and school-based forms of writing and popular culture, this kind of site provides people with opportunities to get more knowledge about popular culture and adopt cultural identities with practicing different writing forms in English without limitation. Due to the function of fanfiction net, a safe and supportive writing venue can be provided with to the writers while the response across geographic borders globally is beneficial to promoting communication and cooperation between fans and help them to consider some social and cultural issues in their lives. From Nanako’s case, we can see that internet has provided a platform for people with different nationalities to form their own community. Also, writing fanfiction magically helped Nanako to grow from a humble ELL to a communicative multi lingual writer, which not only built up her own confidence in language learning but also motivated her to explore different culture. As we all know, the ultimate gole of learning a foreign language is to communicate with people fluently, therefore, the fanfiction writing community is offering learners a very conclusive platform to grow. How fanfiction contributes to Nanako or others language learners? 2. Fanfiction creates a fantastic space for fans to appropriate identities of different cultures in quite an ideally comfortable way. In the case of Nanako, at the beginning of her writing journey, despite her lack of skills and confidence, she already used a Japanese name for a Chinese character (unknowingly), blended American lyrics into her story, and assimilated her Japanese identity into the Chinese character without offending others on Fanfiction.net. From my observation of that site, members in the community tend to be appreciative of each other, probably because they want to receive the same support from other members. I think this shows that fanfiction has realized the many merits of fiction, e.g. arousing empathy from readers, allowing fantasies, encouraging imagination and receiving pleasure from the reading and writing process. Seldom do we find as simple and amazing an idea even so well-accomplished, don’t we? Hi, Camie. I agree with you that fanfiction creates a comfortable platform for fans/writers. And mostly, this kind of learning or writing environment is hard to find or create in schools. Hi, Camie. I agree with you that fan-fiction could be considered as the best way to connect people who share the same interest and same goal together right now. Also, it is meaningful that people are able to find their own identity and make progress. Fanfiction not only provides fans with a wonderful platform to show their admiration for specific works, but also creates great opportunities for language learners to improve their language skills. First of all, fanfiction is the reinvention of a specific work, which means the authors of fanfiction have to read and comprehend the work before writing. In this case, they might gain more vocabularies as well as improve their reading skills. In most case, students get trouble in beginning a new story or creating exciting conflicts to move the story forward. However, in composing fanfiction language learners get more opportunities to take various perspectives on the original fiction, which is a way to motivate creative writing. Actually, sometimes we might find that those fanfiction is much more brilliant and interesting. Michelle, your insight on the original works giving input to the fan-writers is great. The other point about the original fiction helping the people to develop their plot is valid as well. Fanfiction to me is “fan” and “fiction” , a fiction written by its fans. Fans can either adapt the storyline into a different one or continue writing the original story by sheding their own lights on it. Sometimes the author of a fiction ends the story in a way that hurts its fans’ heart or the author suddenly passes away without finishing his work, then fans can continue or reshape the story in a creative way. During the process, fans’ language performance is greatly improved by continual writing and feedbacks from other fans, in addition, fanfiction writing facilitates learner autonomy because the original work is of fans’ interests, they want make some contributions to make it better. Even if other people correct particular mistakes, these fans won’t feel embarrassed for they are in the virtual world nobody knows their real name or address. Hi, Julie.Your explaination of fanfiction is very interesting. Fans can not only interact with others, but also improve their own skills by writing a fiction. It is interesting for you to bring up the idea that people can write their own favorite ending for a story. Also, this is what I found by observing the fan fiction for Harry Porter. 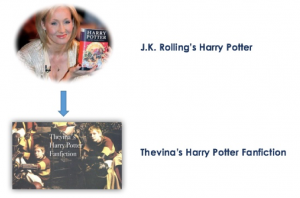 One writer created a new story line for romance between Harry and Hermione, which surprised many fans and stimulated further discussion. Fanfiction is writing in which fans produce their texts on the basis of pop cultural icons or media narratives, for example, extending the original plotline or timeline, creating new characters, or developing new relationships between characters according to their own ideas. Fanfiction has occurred for many years, and new technologies facilitate fans to meet in online community, where they could communicate and cooperate with each other and make comments on each other’s fictions. English language learners can benefit a lot from fanfiction. Firstly, it can overcome linguistic and cultural barriers that separate ELLs from mainstream school population, as in some education institutions, ELLs’ abilities in first language are considered as interruption to learning English, rather than as an additive element for in-class activities. While in the fanfiction community, interactions between writers and readers tend to appreciate various languages, different cultural perspectives, and multiple forms of text. Secondly, on the fanfiction site, there are no certain kind of identity ascribing to the participants, on the contrary, they have freedom to perform their identity in different ways, which will help them gain supportive feedback from readers, thus give them stimulus to continue learning and writing in English. Furthermore, fanfiction site is also a place where ELLs can communicate social and cultural issues related to their lives. And it will bring ongoing benefits to ELLs, as language learning and identity development is a fluid process that traverses national, linguistic, and cultural borders. Yeah, I agree with you that interactions between writers and readers from different language backgrounds can facilitate cross-cultural understanding, which helps language learners build up confidence and what’s more important, contributes to the establishment of independent and unique identity. Hi, Grace. Facilitating cross-cultural understanding is one of the functions that I mostly like about fan fiction. I think the ultimate goal of learning a foreign language is to successfully communicate with people from different countries. Sometimes it is not the inability of using language that prohibits multi language communication but the misunderstanding or ignorance of the other culture. So, fan fiction, creating an multinational community,is providing a great platform for language learners to achieve their goal. 1. In Chinese, fanfiction is known as “同人文”, which means “same characters fiction”. Therefore, my understanding of fanfiction is a fiction which has the same characters or settings as the original work. 2. As the initial post mentioned, fanfiction writing helps Nanako to develop her confidence and be proud of her identity as an Asian immigrant. Also, just as Grace J said, the platform’s positive and supportive nature encourages the fanfiction writers to keep writing and sharing which enables the cultural and linguistic exchange process. Moreover, other than writing skill, reading skill is also promoted when reading the original work and fans’ versions of it. This helps the English learners to read fast and acquire new expression or vocabulary and more importantly, a new perspective of viewing the work. In addition, the web forum includes a comment section. As a result, the participants can have an authentic and timely conversation with kindred spirits. That is to say, the fanfiction participants can achieve satisfaction on both knowledge and emotion. Hi Eva your view about fanfiction is quite interesting for the reason that fanfiction involves authentic interaction with people who have the same interest, and it also enables writers to read more in the target language so as to work out a better fanfiction. To conclude, fanfiction not only facilitates fans’ reading and writing ability but also does good to creativity cultivation. Thank you Julie, for pointing out a new affordance of fanfiction writing. It seems that fanfiction is a combination of the word “fan” and “fiction”, which means the stories written by the fans. They adopt the new plot with the original characters out of interest rather than money. In Nanako’s case, fanfiction writing makes her more confident in language learning as well as her identity finding. The cultural exchange during this process also leaves her a wonderful experience. As for the other language learners, I guess fanfiction mainly help to increase their interests for language learning. Besides, as a kind of reading text, it surely beneficial to readers’ vocabulary accumulation. In addition, fanfiction writing usually includes the plot supplement or the writing in a different perspective, it requires the imagination and creativity, which will be applied in their writing courses. Hi Danella! Your view that fan fiction writers do the writing only out of interest instead of money has really impressed me. I agree with you and think this kind of interest is very important to the learners because that’s exactly what the educational institutions can’t provide for the learners constantly. That is why the platforms such as fanfiction is becoming more significant and indispensable than ever. Therefore, I believe learners should be aware of it and take good advantage of this kind of way of learning English or any other language. Hi, Danella. I concur with your idea that fan fiction is making contribution to Nanako’s gaining confidence in language learning and using as people feel more relaxed to communicate with foreigners in the virtue world as they have more time to do word selecting and sentence forming. As time goes by, they gradually become more confident in language using as they have practiced many times behind the screen. From my understanding, fan fiction is fiction created by fans of certain movies or books which are the origin of their own version of the fiction. The writers (fans) would adopt the same characters and settings in the original work to develop their own thoughts and build their own fantasy world by posting and updating the fiction online. Obviously, the advent of the network has greatly promoted the development of fan fiction. With an easier access to the platform, an increasing number of readers or fans from all around the globe have now come together to share the fanfiction. In this regard, the language learners, either as fan fiction writers or readers, would have more chances to practice both writing and reading skills in a pretty safe and relatively free way. Secondly, it can help improve their confidence in expressing in English, for that they can practice English using a virtual online identity without worrying about the external pressure as they would feel in the real life. Moreover, composing a fiction is also related to dealing with social and cultural issues, which can help the learners explore and gain a broader and deeper understanding of western culture that forms a significant part of English learning as well. Finally, it also helps a lot in keeping and boosting leaners’ motivation and inspiration of learning English because of the precious opportunities it creates for the learners to get into a positive and constant interaction with English speakers. Fan Fiction or FanFic can be defined in many different ways. To me, it is any work which embellishes, alters or rewrites the work of another (usually a published author) with new storylines, characters, alternative endings, or beginnings. Fanfic, without doubt, is a blessing for English learners. It provides a free and open venue to create your own English stories with motivation and imagination. You can also enjoy reading what you are interested in. So the writing and reading abilities will surely be improved in this process. What’s more, culture, as an important element in language learning, can be understood better. Fanfic features the most popular topics, like Star Trek, Twilight, with numerous fans engaging in reading and writing. It is a very good way to know about the up-to-date culture through Fanfic. Finally, as we all know, Fanfic is a complex web of contributors, readers and critics. English learners, whether they are writers or readers, can exchange their ideas with people from diverse cultural backgrounds, thus promoting their interpersonal communicative competence. Despite its obvious advantages, a big issue still gives me cause for concern. In terms of language learning, the materials chosen require much wisdom. But some violent and sexual writings are shared on Fanfic, which involves a large number of younger language learners.There is no control as to what can be written or who can read it. From this angle, there is no denying that it is detrimental. Hi,Eric, I totally agree with what you mentioned about wisdom material selection. From my view, extensive reading conforming to learners’ individual interest deserves teachers’ encouragement out of its motivation function. However, as their facilitator and cooperator, teachers could list some recommended readings, films, dramas concerning to various categories to avoid some misleading art works. Moreover, playing as a big fan of students’ fanfiction work will also be of great benefit to teachers’ monitoring. Yeah Eric, it is also my concern towards fan fiction . Teenagers are not mature enough to distinguish right from wrong and it is easy for them to be misled in the virtue world. Therefore, if teachers want to apply fan fiction as a part of their teaching to improve student’s reading and writing competence, the questions how to supervise and manage student’s time efficiency as well as how to make sure students are not being distracted by other entertainment should by paid great attention to. Fanfiction is “writing that continues, interrupts, reimagines, or just riffs on stories and characters other people have already written about.” (Jamison, 2013 p. 17) It is normally created by fans of the original work, following the settings or characters of that work. From what I’ve learned from your post, learning English via fanfiction writing offers multiple benefits, as exemplified by Nanako’s case. (eg. Boosting confidence and motivation, building self-identity, improving language ability and developing writing skills). From my point of view, fanfiction.net serves as an online communication community, creating a more relaxing atmosphere for participants to practice English through reading writing and exchange thoughts with individuals who share their interest. Members of this community are free to express themselves and use language out of interest. As such, they are more likely to learn effectively and happily without the pressure of formal classroom setting. Besides the improvement of language proficiency and learning efficiency, their communicative ability could be enhanced through communicating with their like-minded friends from across the globe in online space. On top of that, writing and reading could also help to improve learners’ imagination and creativity in the process. I think writing fan fiction is a good practice for language learners, if you can find a platform that you are interested in, it will motivate you. Even if your grammar is inaccurate, your dialogues pedestrian, and your characterizations jumbled, you don’t stand to lose anything by telling a story. In fact, the more you do it, the better you will get. When you are actively engaging in the business of storytelling, you will learn more from writing fan fiction. The comments from other readers can help you polish your works and shape your ideas. Wicked is fanfiction of The Wizard of Oz. The Musical Hamilton is fanfiction of Alexander Hamilton: A Biography. Dante’s Divine Comedy is fanfiction of The Aeniad, which is fanfiction of The Iliad and The Odyssey. It is a good attempt to write fanfiction for those who enjoy writing. The benefits will not only be limited to language learning. Some comments above mentioned the disadvantages of fanfiction, such as the violent and sexual writing materials may harm to young learners. As a result, it’s crucial to implement positive guidance, thus creating a better cyber environment. Hi, Vicky, I agree with you that fanfiction writing provides language learners a good platform to tell their own stories by using the characters they like. I think the original intention for writers to write a fanfiction is to satisfy themselves. For example, when Rowling finished Harry Potter, there are so many fans still looking forward to read the stories happened in that magic world, but since Rowling has already finished the series, they choose to tell the stories by themselves. Thus, in this way, the language itself seems not that important in story telling. The language proficiency will not influence the writer’s willing to write his own story, which helps a lot of language learners to stand on the start point of writing a story. To be frank, what I all knew about fanfiction before is related to the adaptation of published or created literature work. Until this exploration, I became aware that fanficiton is one type of written work created by fans. They borrow main characters, settings or plots from the original work, recreating it with the integration of popular cultures. Other than the literature work, the original could be all forms of art work, including comics, movies, games, etc, satisfying a great number of English learners with different hobbies. In the field of English language learning, fanfiction has also gain its positive position. As one kind of writing based on the acknowledged work, it requires the writer to do an intensive reading and critical thinking before his or her own producing, which exactly follows the trend of writing learning approach — reading to write. Besides, as the mentioned case of Nanako’s, fanfiction provides an unrestrained creation platform where any unrealistic imagination and understandable grammatical errors would be allowed, inspiring learners’ creative writing and motivating their better English learning. Besides, due to the trans-regional and simultaneous feature of internet-based fanfiction, it might attract a lot of readers of various nationalities, including English speakers. They comment and reply each other, unconsciously contributing to a tandem learning context to promote their writers English learning. I agree with your positive comments and attitude towards fanfiction. It is beneficial to both readers and writers in many aspects. Two key factors that generate these benefits, in my point of view, are peer feedback and motivation, which are very significant in language teaching. But there is still imperfection for fan fiction in terms of writing skill development. As the name of fan fiction indicates, writers may make great progress in the field of novels and fictions. But they still lack the opportunity to try other genre discourse like applicable discourse or argumentative writings. As for the education of writing classes, we the teachers still need to provide chances and platform for them to cover more genre writing. 1. Fanfiction is quite popular all over the world, many excellent writers in China even have a group of big fans. The writers of the fanfictions use the same characters and background setting of the original literary works to create their own stories. Interestingly, another phrase created together with ‘fanfiction’ is ‘OOC’, which is the abbreviation of ‘out of character’. Most of the fanfiction writers will remind their readers in advance when they give new characters to heroes or heroines to let their readers decide wether they can accept the change of the original characters. I think this may show that the most readers still prefer the fanfictions which are stay faithful to the originals, that is why the fanfictions exist. The readers still want to read the stories happened in that fictional world created by the original writers. 2. To Nanako, as it is mentioned in the post, fanfiction writing increases her confidence, and also, since she likes original work, fanfiction writing provides her a strong motivation to keep her writing. What’s more, in the online cross-cultural communications, she identifies herself better in a multi-culture environment. But in my point of view, fanfictions not only provide writers a lot of advantages, they still benefit the readers. Firstly, since they are interested in the original stories, the reading motivations of the readers are high, which can help them stay patient when come across some new words. Secondly, because the readers are already very familiar with the characters and settings of the stories, compared with reading a totally new work, the new words in fanfictions have less impact of their reading fluency. Many readers can guess the meaning of the new word easier since they are familiar with the context, which still help increase the reading ability and motivation for readers. I think one of the most typical features of the fanfiction is adapting and creating. Some writers of the fanfiction put the roles of the original novels into a totally new environment created by them, and some create new characters into the original novels. Others change the plot or ending of the original ones based on the original settings. 2. I think the writing and reading of fanfiction is helpful in learning a target language. First, fanfiction writers write novels or articles in target language tend to change the plots or endings according to their own preference to satisfy themselves and also the fans who share similar taste with them sometimes because they are disagree with the original writers, and sometimes they just do it for fun. This kind of satisfaction gives them the motivation to write. Second, it provides a relax environment for language learners to write and read. The post has mentioned that fanfiction writers share their works in the platforms like fanfiction writing community where they can conduct “a safe and supportive writing.” That is the difference between fanfiction writing and the traditional writing task assigned by teachers because the fanfiction writers and readers do not have to worry about mistakes and marks too much. 1. Fan fiction is fictions that are created by others but still depend on original characters and settings. It is a great way of development of imagination and creativity as well as writing skills and wider range of knowledge. It is also very popular among young generations in China with another address of “同人创作”. 2. Based on the already well-known characters and settings of the original fiction, fan fictions seem more appealling and interesting to readers. Readers will be loaded with enough passion and curiosity to read the works by other fans. At the meantime, they are probably more critical and careful about the newly created stories. Therefore, communication and discussion among the readers and authers would increase, which is helpful and challengable to the writers of fanfiction, because readers feedback can sometimes carry large amount of inspiration,criticism and advice. Also, writers would gain confidence, progress and continuous motivation during the communication with online fans and their feedback. This is crucial for any writer. And then the sucess of these writers will encourage readers to follow them and try their own works, making use of their imagination. This is a win-win situation among readers and writers. 1. Actually, different people have various opinions over fanfiction, and people’s definitions of fanfiction can also be different from each other. As far as I’m concerned, fanfiction is the fans of one literature write another story with the same characters based on their own imagination and their position on the characters in the story. Thus, fanfiction provide fans a platform to convey their ideas and emotions over a piece of work they loved. 2. It is obvious that fanfiction has its merits and demerits. I looked through the website of fanfiction, and I found that there are tens of thousands of literature have been recreated by the fans. (https://www.fanfiction.net/book/). Actually I think this is a very interesting phenomenon. Because of the preference to a literature, a fan become a writer and also get fans who like his or her work. The writer of the fanfiction may be motivated by other’s comment and preference. Thus, he/she may learn a lot from writing the fanfiction. As for the readers, they can comment on the work, and also show their own opinions. During this interesting process, individual can make friends and improve their language skills with this platform by interacting with each other. However, there is one thing should not be overlooked. Comments posted on the website are relatively free, and some readers may not be satisfied with what the author has written and attack the author with abusive language, which may demotivate some language learners who try to improve their language skills by writing fanfiction. 1. In my point of view, fanfiction can be regarded as a second creation of the original characteristics based on the knowledge of social discourse, which cannot be limited by the nation or other boundaries. And we can see it from the internet which is the platform. 2. At the same time, something can be both preserve and lost in the recreation of the original fiction. On the one hand, if we want to create a fanficion which has the same characteristic, we can preserve some characteristics of them and change it a little bit. As a result, readers can recall the images and episode when reading the new one. On the other hand, something must be changed . In other words, fanfiction should add a new life and feature to the old one, which can be really interesting for readers to explore the possibilities of storylines as well as filling the regret. Hello, Annie, I suppose you are in charge with this post. I think fan fiction is a really interesting topic, but I have to admit that I really doubt whether these fan fictions are written in the fans’ target language, and can it really improve their language skills at first. However, after I scanned the fanfiction.net, and looking at the profile of the “fanwriters”, I found that though many fans are writing in their mother tongue, there are some writing in their second or even third language. It seems that these writers are beloved fans for the original work. They are not afraid of criticism for language problems and they are trying to transfer their thoughts into a globish world that everybody can understand it. This website is really a good platform for these beloved fans to gather together. Satisfy their fantasy and share their love. BTW, the cross-cultural understanding you mentioned really make sense, the fans have to get much input, about the background, the character of the characters, the words he or she may use. It is a huge project to accomplish a good work. But about the target language writing, it may be not that effective. 1. Thanks for the hyperlink, I got to know the notion of fanfiction for the first time. I suppose that fanfiction is the fiction written by fans of the original work. 2. I think that you have already mentioned in the article that Nanako has developed her confidence and her identity as an Asian through the process of producing her fiction. And I think it surely does good to other fanfiction writers. Firstly, when one decides to write fanfiction, he/she should be familiar with the original work, which means that one have to read the original work many times so as to fully understand the plot and structure of it, the relationship between different characters in the original fiction and the intended goal of the author. By doing this kind of reading, fanfiction writers can practice their own reading skills. Secondly, during the process of writing, these writers are highly motivated out of their favor of the original works. And the high level of motivation can make it more easily to improve their writing skills. Also, after the writers post their works online, they can receive a lot of comments from other fans of the original works, which means they can not only exchange their ideas about the original work with each other but also can improve their writing skills by learning from others’ advice/comments. In short, I believe fanfiction is the novel or literary creation written by fans of the original one. 2. From the article, we can learn that Nanako becomes more confident and motivated to write in English, more importantly, she found her cultural identity eventually through the process of fanfiction. The readers’ feedbacks about Nanako’s work play a facilitating role in promoting the developments of the original work since they add some new vitality into the work. From my viewpoint, firstly, fanfictions help readers with brainstorming ideas for stories, which gives person imaginary spaces. Secondly, through the settings of the feedbacks, the fans from different part of the world can create cross-cultural understanding among themselves, which helps to promote cultural diversity or even make an impact on world issues. Lastly, the person who is not the English native speaker but tries to use English to recreate the literary works will definitely gain a lot of practices. In mainland China, vitually, many middle school students are keen on writing fanfiction themselevs. For them, writing a fanfiction is a bridge to link their dreams on the fiction and the content of the fiction. In the fanfiction, they are able to make up for any pity in the fiction. For example, lots of young girls are interested in romantic novels, and after the ending of the novel, they still cannot be satisfied. Therefore, they conduct their imagine in writing the sequels or other version of stories. I supposed that if English teachers can make good use of this kind of genre, then students will be more fascinated with the language lesson. I think fanfiction is useful to second language learning and communication. As a interest based wtriting process, writers could learn more cultural background and language use during the time. Also, it is a way of get into the study community and find the self-identity in the community. Along with the other fans with different cultural background, it is useful for the language learner to practice language and get multicultural experience. I personally would like to try this way to study and teach language in the future. Personally, fanfiction is a kind of pursuit of production out of the desire for their icons. Nanako becomes unprecedentedly confident and prolific out of her constant love for the icons and the work, and makes great links between one and another with platforms. Fan-fiction is beneficial not only to our language learners but also to the ones intend to improve their writing skills, communicative capabilities, and creative thoughts as well. In my opinion, Fanfiction is a rewrite based on an original work, and Fanfiction net provides this opportunity for fans who are interested in creating a new story in their own ways. From Nanako’s experience, I realize that writing a fanfiction can make contributions to language learners in several aspects. First of all, people from different cultural backgrounds gather together, exchanging and sharing different ideas via online writing, therefore, learners can increase their knowledge and have access to comprehensible language input. Secondly, as the writing venue creates a relatively safe and relaxing environment for learners, they may become more willing to communicate with others without anxiety, and during this process, people will gradually increase their language learning by realizing and correcting their mistakes and make their language more accurate. Besides, the function of making comments and getting feedback cannot be ignored, because they help achieve cross-cultural communication and increase learner’s motivation. I think what we have done in the class that Christoph asked us to do a reporting from the scene of a fairy tale is a successful example of how to combine the form of Fanfiction with our language classes. In a broad sense, Fanfiction is the fictions written by the fans of a characters or setting from an original work of fiction. This concept may be meaningful for those who have great passion for a particular character and motivation for writing. However, I most students won’t have the patience and perseverance to do a Fanfiction by themselves, thus my thinking on this topic is that the feasible way to combine this form with our language teaching classes. Therefore, to my understanding, Fanfiction in language learning classes can basically serve as a motivation to promote students’ engagement in the learning activities. Hi, Grace, I agree that writing fanfiction needs endeavors. I also have it in mind that instead of letting students to do their our production, we should provide them with the ways to come up with new ideas. sometimes, it is the way of thinking that constraints our moves, and it will be hardly for us to think of a new thing. above all, we should cultivate critical thinking, and do not be a passive learner. Fanfiction is a fiction that allows various of rewritten versions of the original texts. Still, the creations have to be set on the basis of the original one. For one thing, fanfiction satisfy those who are discontent with the original texts by providing them a chance to rewrite at their own will. Although the new script may not gain the popularity, it will become an unforgettable experience as long as individuals have been involved. For another, since individuals have to carry on the names, background and so on, into their own production, to a certain extent, their creativity is limited. Because they are likely have generated some ideas on those names, or backgrounds. But to obey the rules and show respect to the author, they would not dare to take a step further to make a change.